ThirtyFifty wine tasting vouchers make fab birthday pressies for wine loving friends & family and can be redeemed against our Wine Tasting Evening experiences or One Day Wine Courses and Weekend Wine Tastings in various locations across the UK. We can also come to your home to host a wine tasting for a minimum of 10 guests. Our Evening Wine Experience Wine Tastings are run regularly throughout the UK including in London, Bristol, Birmingham, Cardiff, Liverpool, Leeds, Leicester, Manchester, Sheffield and Norwich. All evening events include antipasti platters or canapés to accompany the wines. Our London Supper Club is £49 per person and includes a main course and cheese. Our One Day Wine Courses are held in London at Brasserie Blanc, Bristol at Browns Brasserie and in Cardiff at Le Monde, — all in central, easy to get to locations and provide a great quality three course lunch with matching wines. Getting away from the city, in countryside locations we also host the day courses in Cheshire and Buckinghamshire. Our Weekend Wine Tasting Breaks make a great weekend away for two as a Christmas present to each other or to parents. For 2018/2019 we have two locations in Buckinghamshire and Cheshire offering everything you need for a relaxing wine tasting break. One night's accommodation, meals and our One Day Wine Course or Discovery Course on the Saturday - all for £159 per person. Open-dated Vouchers are available or you can book a specific date with us. 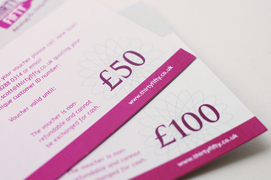 Our gift vouchers are open-dated and valid for 24 months (can be extended) and can be emailed free of charge or we can post a printed voucher presented in a smart purple envelope for £2, allow 2-4 days for delivery. Order online or call us on 020 8288 0314 and we'll be happy to help! Not sure which Wine Tasting Voucher to choose, or want to treat your family to a wine tasting at home, why not purchase a £50 or £100 Gift Voucher. These vouchers can be used towards any of our wine tastings or to purchase wine from our online shop. The vouchers can be used as full payment or part-payment towards wine or a wine tasting and are valid for 24 months. Vouchers are emailed free of charge or for an additional £1 we can send a printed voucher by post. Please allow 2-4 days for delivery. I just wanted to say a massive thank you for the wine tasting on Saturday. Myself and Liz (her birthday present) had a lovely time and really learnt a lot. Our tutor was really knowledgeable as well as welcoming which made it really easy to enjoy and find out more. There was plenty of time for questions and the food was also delicious. I really appreciate it and will recommend it to friends.